TS Inter 1st year Admissions 2018 schedule for Govt, Private, Residential, SW,TW, Model Junior Colleges. TS Junior Inter admissions. Last date for submission of Inter 1st year application form. TS Junior Colleges & Composite Degree Colleges offering Two years Intermediate course in in General & Vocational streams the State. First Phase Intermediate Admissions Schedule. The classes for first & second year Intermediate course will commence from 12-06-2018. 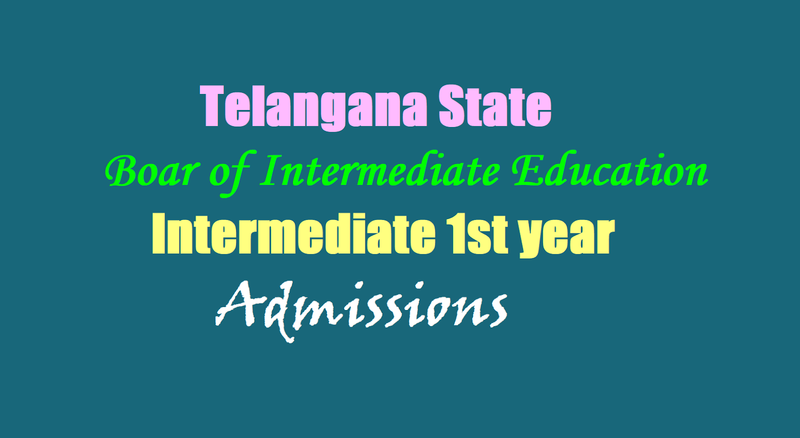 TS Inter first year admissions schedule, Government / Private aided/ Private un-aided / Co-operative / Residential / Social welfare / Tribal Welfare / Incentive / TS Model Jr. Colleges Inter 1st year admissions. Web News: Inter board announced the Schedule for admission into intermediate 1st year in Junior colleges in the Telangana state. Application submission process to be started from today till 30th of this month. The first phase admissions will be started on 12th of this month and Intermediate 1st year Classes to be started from June 12. The first phase admission process would be completed till 30th of this month. This year, there are no online admissions and the old admission process system will be continued this year. The Telangana Intermediate Board has issued a schedule for admission into government, private, aided, model schools and gurukul junior colleges in the state. The first phase admissions will be started from 21st of May. The colleges to distribute the application forms to students and for admission process. The first phase is to be completed by June 30. From June 1 it is clear that classes should be started. These provisional admissions have been made based on Internet Marks Memos. Transfer certificates and original SSC memos have been confirmed to confirm their admissions. The second phase of the admission schedule will be issued later. The Board has suggested to all principals of junior colleges that all the seats should be allocated based on the Rules of Reservation. 5. Admissions should not be made in the combinations canceled by the board. 10. Details of affiliated colleges can be obtained on the board website (tsbie.cgg.gov.in). Parents should include their children in recognized colleges. Board of Intermediate Education, Telangana State: Admission Schedule for the academic year 2018-19 issued by Board of Intermediate Education, TS and Certain Instructions to the Principals of Government / Private aided/ Private un-aided / Co-operative / Residential / Social welfare / Tribal Welfare / Incentive / TS Model Jr. Colleges in the state. The Principals of the Government / Private Aided / Private Unaided / Co-operative / TS Residential / Social Welfare Residential / Tribal Welfare Residential / Incentive / TS Model Junior Colleges and Composite Degree Colleges offering two year Intermediate course in General & Vocational streams to take special care in enrolment of students for the academic year 2018-2019 by making admissions in two phases. The first phase of admission schedule is given below. The schedule of second phase of admissions will be communicated in due course. The classes for first & second year Intermediate course will commence from 01-06-2018. The Principals can make provisional admissions on the basis of Internet marks memos. The provisional admissions made will be confirmed after the production of original SSC pass certificate and Transfer Certificate issued by the school authorities, where they last studied. The Principals may follow the rules of reservation in admissions as per rules in force. In view of the introduction of grading system in SSC, admissions should be made based on GPA (Grade point average) and subject-wise grade point (GP) obtained in the qualifying examination as per the enclosed guidelines. They should not conduct any test for admission. Stringent action will be taken against the junior colleges making admissions on any other basis. During the period of admissions the managements to display prominently at the entrance of the building the number of sections sanctioned by the Board of Intermediate Education for the academic year 2018-2018, the number of seats filled up in each section and the number of seats vacant in each section. This information should be updated on a daily basis. All the Principals of unaided junior colleges are instructed not to resort to issue of advertisements with inducements amounting to violation of Rule 7 of Andhra Pradesh Public Examinations (Prevention of Malpractice & Unfair means) Rules 1997 issued in G.O.Ms.No.114, dated 13-05-1997. Any violation noticed will be dealt under law. All the Principals to incorporate Mother's name and Father's Name in respect of joining children as it is in the records of qualifying examination. All the Principals to take measures to ensure security to girl students. In view of the introduction of grading system in SSC, admissions should be made based on GPA (Grade Point Average) and subject-wise Grade Point (GP) obtained in the qualifying examination as per the guidelines. They should not conduct any test for admission. Stringent action will be taken against the junior colleges making admissions on any other basis. It is mandatory to submit the Aadhaar number of the student who wants to seek admission in Intermediate course in Private Aided, Un-aided, Social welfare, Tribal Welfare, BC welfare, Minority Residential, Model school/Junior colleges and Government Junior Colleges in the state of Telangana. The Principals of unaided junior colleges are hereby directed that they should make admissions only upto the sanctioned sections and upto the ceiling strength of 88 in each section. They are further directed not to make admissions in the combinations dropped by the Board. The admission into additional sections should be made only after the permission is issued by the Board. Violation, if any, will be liable for action including levying of penalty and disaffiliation of the college. During the period of admissions the managements are requested to display prominently at the entrance of the building the number of sections sanctioned by the Telangana State Board of Intermediate Education for the academic year 2018-19, the number of seats filled up in each section and the number of seats vacant in each section. This information should be updated on a daily basis. All the Principals of unaided junior colleges are instructed not to resort to issue of advertisements with inducements amounting to violation of Rule 7 of Andhra Pradesh Public Examinations (Prevention of Malpractice & Unfair means) Rules 1997 issued in G.O.Ms.No.114, dated 13-05-1997. Any violation noticed will be dealt under law. All the Principals are instructed to incorporate Mother’s name instead of Father’s Name in respect of Jogini children as it is in the records of qualifying examination. All the Principals are instructed to take measures to ensure security to girl students. The candidates who want to seek admission on condonation of gap period, have to obtain a certificate of local candidate / residential certificate for the gap period from the local Tahasildar. Parents and Students are hereby informed to take admissions in only affiliated Colleges, as the List is provided in official Website of TSBIE i.e. www.tsbie.cgg.gov.in.